These photographs show: "Simonis Januensis opusculum cui nomen clavis sanationis simplicia medicinalia latina greca at arabica ordine alphabetico mirifice elucidans recognitum ac mendis purgatum et quotationibus Plinii maxime: ac aliorum in marginibus ornatum. Venice: For heirs of O. Scotus by B. Locatellus, 1510." Images courtesy of the Wellcome Library, London. 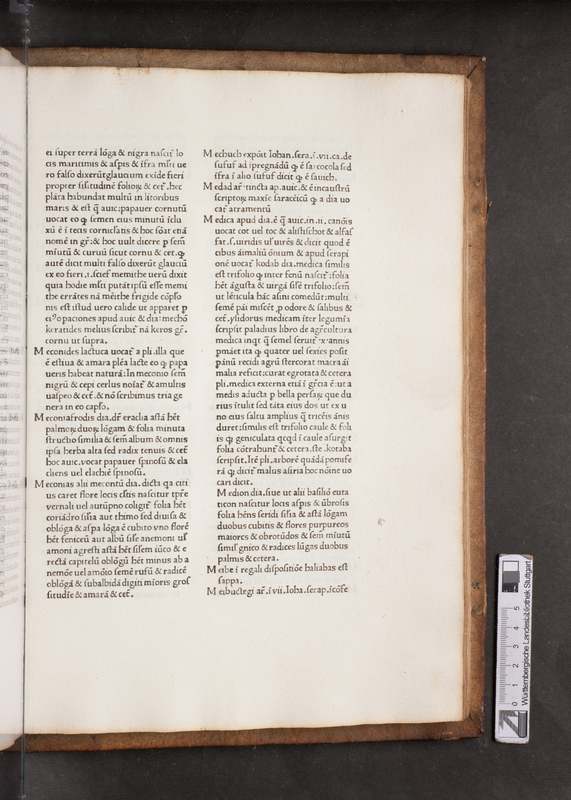 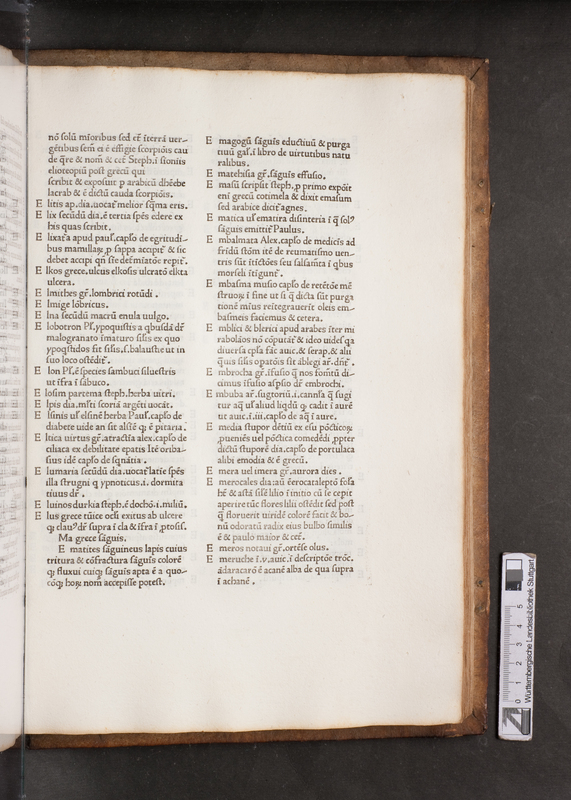 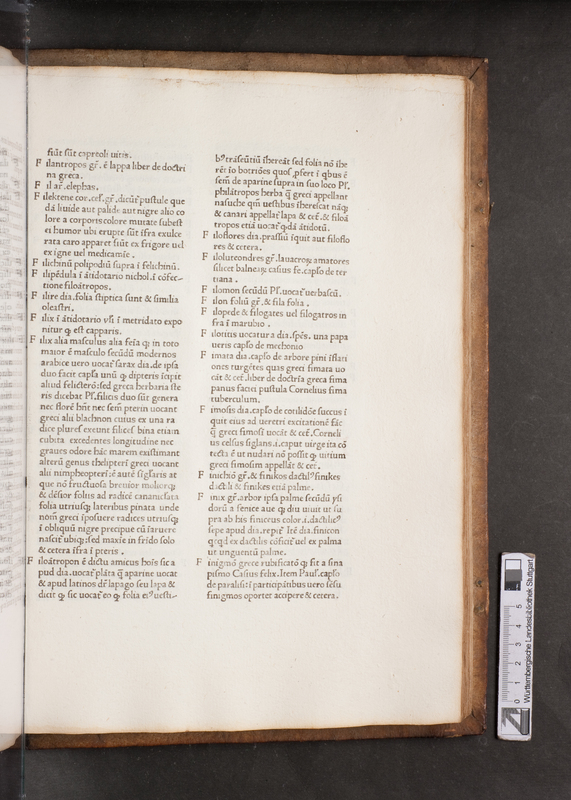 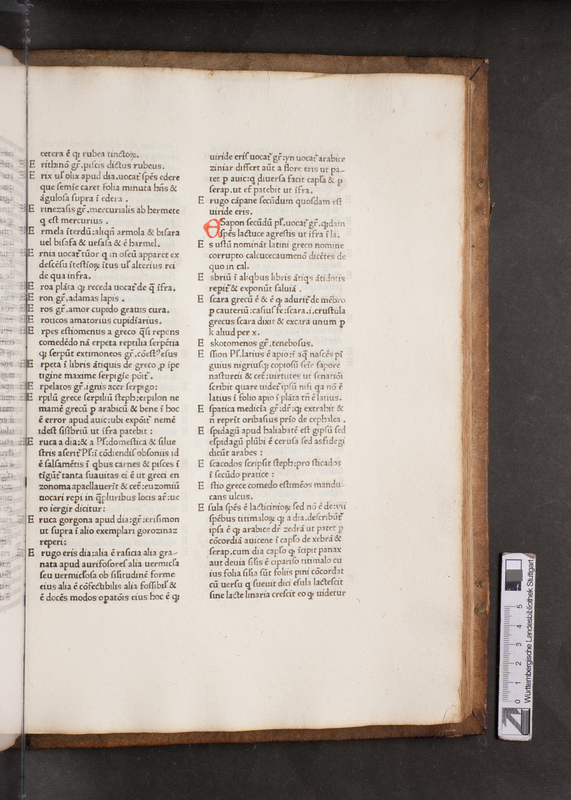 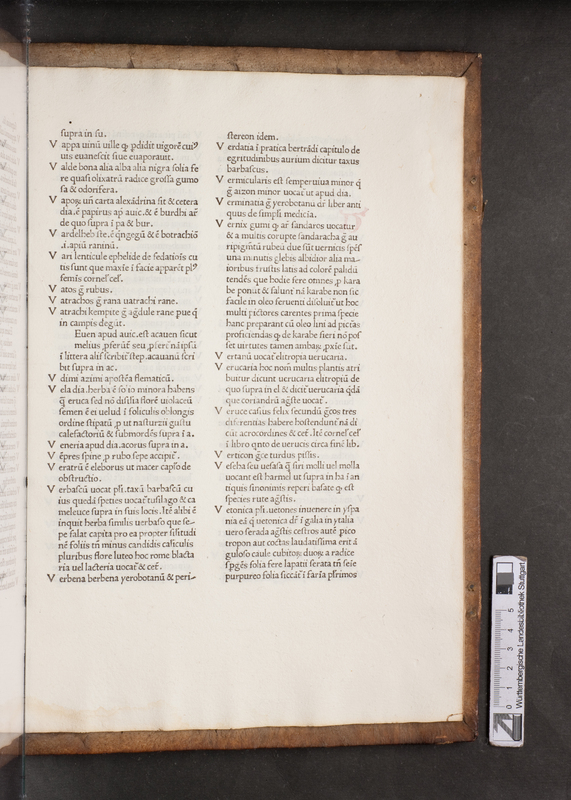 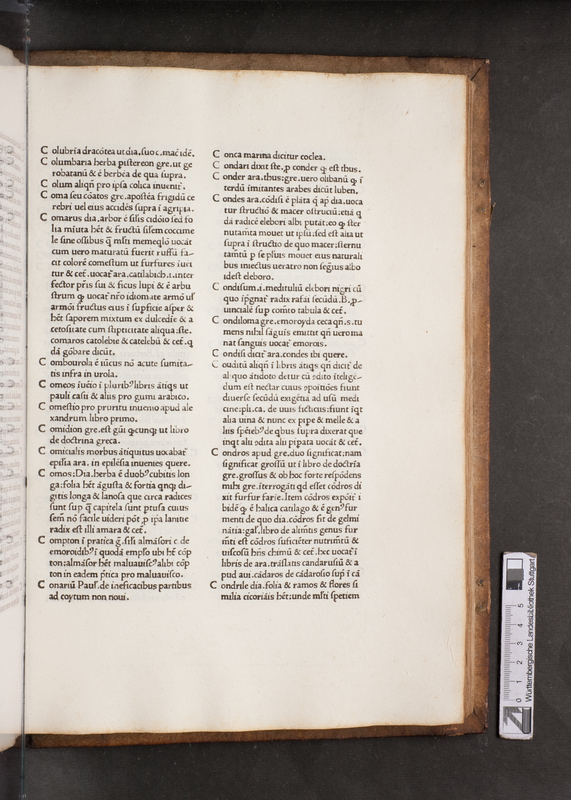 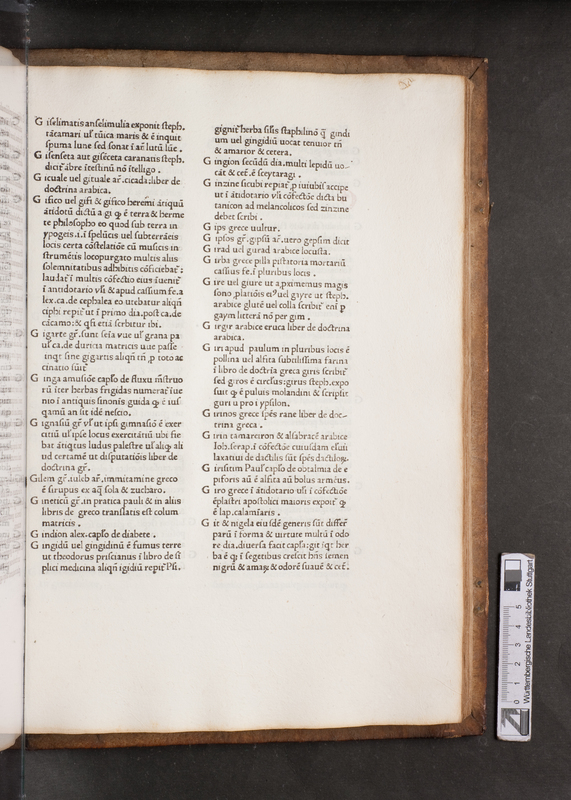 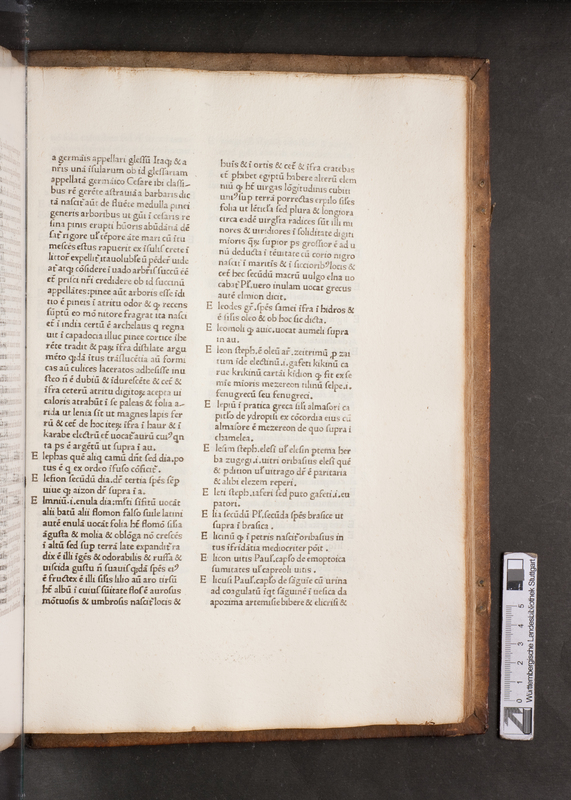 These photographs show: "Synonyma Simonis Genuensis, opus impressum per Antonium Zarotum parmensem, Milano 1473." 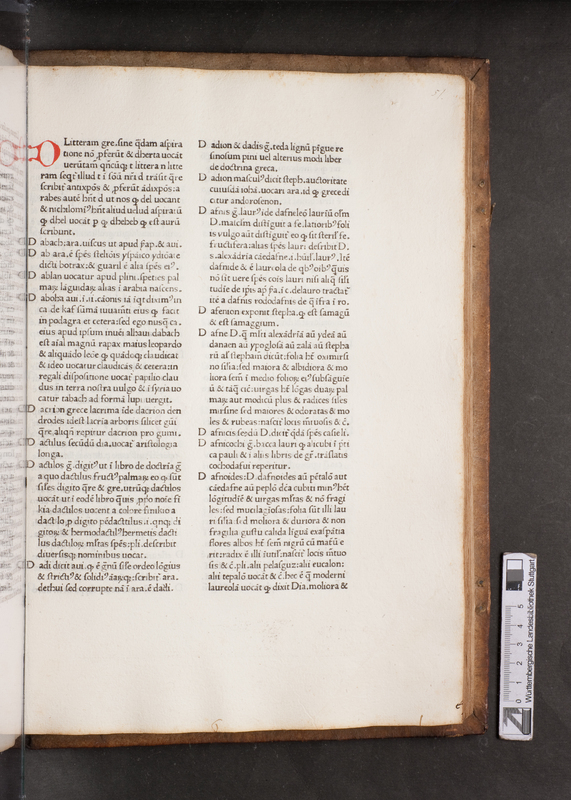 Images courtesy of Württembergische Landesbibliothek, Stuttgart. Simonis Ianuensis opusculum cui nomen clavis sanationis simplicia medicinalia atina greca at arabica ordine alphabetico mirifice elucidans recognitum ac mendis purgatum et quotationibus Plinii maxime: ac aliorum in marginibus ornatum et quam diligentius ac correctius id fieri potuit impressum, [Finis Simonis Ianuensis additis auctoritatibus Pinii locis propriis per Georgium de ferrariis de Varolengo montiserrati. Artium et medicine doctorem], impressum Venetiis per Gregorium de Gregoriis 1514. (This witness usually goes together with A. It is only occasionally collated for the sake of clarity). This book presents a different combination of readings than the other witnesses. 1r-3v Preface; 3v Preface-Abrungi; 4r Abrotanum-Absius; 4v Abs-Acanthis; 5r Acanthis arabica-Acanthion; 5v Acanthus-Cedula; 6r Acelea-Aconitum; 6v Acopum-Acrimia; 7r Acros-Adana; 7v Adaria-Adilios; 8r Adipsa-Aphorismus; 8v Aphramia-Agiros; 9r Agma-Agripne; 9v Agrissythi-Alabuch; 10r Alacoen-Albusse; 10v Alcabat-Alcyonium; 11r Alcoit-Alexandrina; 11v Alfachi-Alicacauos; 11v Alyces-Alithinos; 12r Alithia-Almirogarus; 12v Almolosat-Alseis; 13r Alsinen-Alnmen; 13v Alumen-Amahugato; 14r Amaurosis-Amguilananum; 14v Amici-Amomum; 15r Amoresia-Ampelos agria; 15v Ampelos cenophoros-Anagalicum; 16r Anagiros-Anciloblefarus; 16v Ancistrum-Androsemon; 17r Androsemen-Anithon; 17v Anfehe-Antalis; 18r Anthera-Antimis; 18v Antimonium-Anthos; 19r Anthraces-Apios; 19v Aforis nigra-Apomellis; 20r Apoplexia-Araneas; 20v Aratilli-Argimonia; 21r Argilla-Armech. Wellcome Library, Western collection, MS 167, ff. 2r-99v. Many thanks to Brigitte Pfeil for pointing it out. A collation of Cameleon (1) reveals similar readings to f and g.
1r-2r Preface-Aburungi; 2v Abrotanum-Acalifex; 3r Acalta-Achauan; 3v Acedula-Aconitum; 4r Acopum-Adhyacis; 4v Adarian-Afacaten; 5r Afaco-Agnus castus; 5v Agrifolim-Akris; 6r Alahabar-Alcharthi; 6v Alcea-Alendebema; 7r Alerki-Aliotica; 7v Alipiados-Almuri; 8r Alnus-Alhulbub; 8v Alum-Ambrosia; 9r Amelegum-Amoniacum; 9v Ampelos-Anacardus; 10r Anacollum-Anchusa; 10v Andachocha-Anemonis; 11r Antesis-Antilops; 11v Antiminon-Antroiadis; 12r Antropomofon-Apodhia; 12v Apoclismon-Artioti; 13r Aretiono-Amech; 13v Armenium-Arthemisia; 14r Arcion-Asclepias; 14v Aschilites-Asogiros; 15r Asoliptoos-Astaurodum; 15v Astaraticon-Attitum mel; 16r Atiactala-Avissa; 16v Aukos-Azula. 16v B littera; 17r Bahar-Balsamum; 17v Babasti-Babascus; 18r Barcharcharaha-Bechion; 18v Bechion-Berseaiscen; 19r Bersersanum-Bitumen; 19v Bissum-Bottis; 20r Bracteos-Brumos; 20v Bromos-Buncha; 21r Bumon-Buzeiden. 21r C littera-Cachochimon; 21v Cachoetes-Calamentum; 22r Calamitis-Calcantum; 22v Calcantos-Chamebalanos; 23r Camecisce-Cameleonta; 23v Cameleucen-Candarusium; 24r Candirie-Carambe; 24v Caratin-Caritias; 25r Carmet-Cassia; 25v Cassilago-Catastropha; 26r Catatir-Chatin; 26v Caxros-Celidonus; 27r Celidria-Centrum; 27v Centonicum-Cestron; 28r Ceruleus-Cicorea; 28v Cicoria-Chinabar; 29r Cinnamum-Cinus; 29v Cinus-Ciseos; 30r Ciseleon-Cochuian; 30v Coclea-Coli; 31r Coliandrum-Collirium siulustro; 31v Collirium acharistum-Condes; 32r Condiloma-Cohol; 32v Coptoria-Corub; 33r Corus-Crino; 33v Chrion-Chrizonichia; 34r Crocodillus-Cundes; 34v Cunthe-Cutini. 34v D littera-Dafnocosi; 35r Dafnoydes-Delecteron; 35v Dhelft-Dyacitonitem catarticum; 36r Dyacolloquintidos-Difrigis; 36v Degegi-Diptarmiten; 37r Diptenus-Dracomata; 37v Draco-Duhun hebelesamum. 37v E littera-Echeon; 38r Echidhna-Egilopa; 38v Egoceron-Eleborus; 39r Eleboritis-Ellepui; 39v Elesim-Elkra; 40r Elminthes-Empima; 40v Empiotica-Enhemon; 41r Enfisena-Epilepsia; 41v Epilipsia-Eptaphilon; 42r Eptaplemon-Erine; 42v Eris-Espastica medicina; 43r Espidagum-Euforbium; 43v Eufrosinum-Ezerhasen. 43v F littera-Faba egyptiaca; 44r Faba-Fanfurungi; 44v Farsarsirium-Fengarion; 45r Fengos-Ficus; 45v Ficus maritima-Fitrias; 46r Flammula-Folium indum; 46v Fomentatio-Fuligo; 47r Fulonum-Furfurrisce. 47r G littera-Galbanum; 47v Galeos-Garus; 48r Geduar-Genista; 48v Geniculata-Gisanpelitis; 49r Gischia-Glaucoma; 49v Glaucosis-Glicoriza; 50r Gliconium-Gramas; 50v Gramen-Gumi asimar; 51r Gulben-Guttu. 51r H-Halrian; 51v Haliligi-Hasas; 52r Hartoma-Hazez; 52v Haegi-Hermagules; 53r Hem-Hiberida; 53v Hyra-Hyu; 54r Holbe-Hunesum. 54r I-Iatis; 54v Iaspis-Iengries; 55r Iensir-Inrmo; 55v Interion-Ipopia; 56r Ipopitamos-Ipopotanios; 56v Ippisis-Ischion; 57r Ischis-Iuniperus; 57v Iuscollex-Ixos. 57v K littera-Kakille; 58r Kakochimon-Karbit; 58v Kardamomum-Katil; 59r Katin-Kenkamides; 59v Kepsos-Kinicom; 60r Kinodontes-Khobusbace; 60v Kodie-Kubube; 61r Khubeze-Kust. 61r L littera-Lacticinia; 61v Lactuca-Lapatum; 62r Lapatiolum-Lapis ferugegi; 62v Lapis frigius-Laserpitium; 63r Lasine-Lemnias; 63v Lemonion-Letargia; 64r Leteltea-Libanotis; 64v Labanotis-Liembre; 65r Lien-Lingua; 65v Lingua bovis-Lithos emathites; 66r Lithogonia-Lothos; 66v Lothos arbor-Lutum vitis; 67r Lutum samium-Luzach. 67r M littera-Malagma; 67v Malagma-Mandragora; 68r Maniam-Mastix; 68v Massum-Medica; 69r Medion-Melea; 69v Meleh-Mellilotum; 70r Melissa-Mercurialis; 70v Merdasengi-Mia; 71r Miagros-Miopie; 71v Miosota-Miriofilios; 72r Miris-Moabes; 72v Mochenagria-Mucla; 73r Mugath-Muzum. 73r N littera-Nahale; 73v Naha-Nardus; 74r Narengenbin-Neriden; 74v Nessem-Nixa; 75r Nixe-Nux tamarisci. 75r O-Ochimonides; 75v Octobrisicum-Olea; 76r Oleum de amigdalis-Oleum milinum; 76v Oleum melantinum-Omfacium; 77r Onfacum mel-Onomia; 77v Onosacti-Orchis; 78r Oregmosi-Orbacce; 78v Orblacen-Oxalmum; 79r Oxiachantos-Ozimum. 79r P littera; 79v Pachumeres-Panaces; 80r Pancratium-Papaver etiam rubeum; 80v Papirus-Parachisis; 81r Paracolesis-Partenudi; 81v Parulis-Pentafilon; 82r Pentalon-Peritraneon; 82v Peredexios-Pezice; 83r Picata-Pyriasis; 83v Pirilampis-Plantago; 84r Planta leonis-Polignemon; 84v Poligonos-Polisanthemum; 85r Politricon-Pomfoligx; 85v Pontica-Persica; 86r Precordia-Psuasis; 86v Pseudo-Pterigia; 87r Pterigion-Pulea. 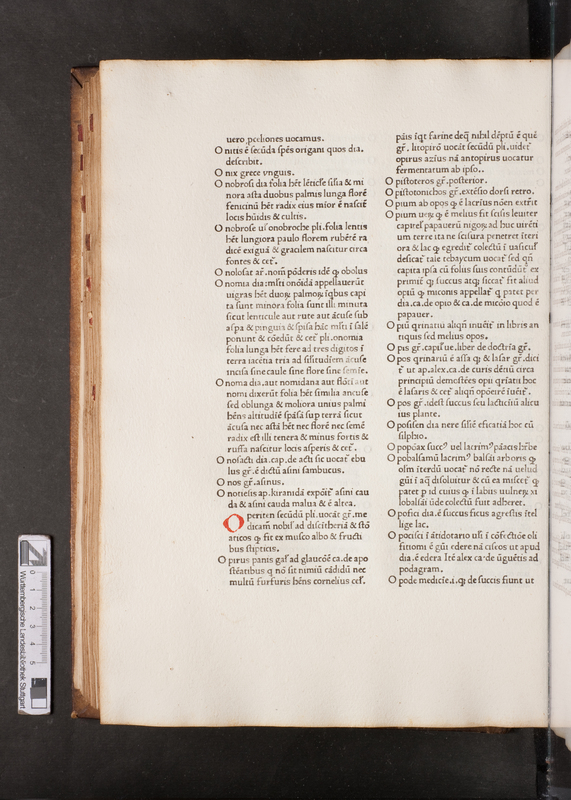 87r Q littera-Quebenomelet; 87v Quebritum-Quitisum. 87v R littera-Radicula; 88r Radiolum-Rasathum; 88v Rasienegi-Resis; 89r Retin-Rodon; 89v Rodora-Rubus; 90r Rugge-Ruta. 90r S littera-Sabor; 90v Sacamonie-Sal; 91r Sal masse-Sanbucus; 91v Samia-Sansucus; 92r Sappa-Satyrion; 92v Satureia-Scamonea; 93r Scandalicon-Sceitaragi; 93v Scehemunigi-Sciromanum; 94r Scirpus-Scolopendia; 94v Scolopon-Sedum; 95r Sehedenegi-Seniarum; 95v Senkesebubaru-Sertula; 96r Sesamoides-Sicadi; 96v Sicla-Sidion; 97r Sidigunta-Simfitum; 97v Sinula-Sinopedion; 98r Sinthesis-Siseli; 98v Siser-Skotia; 99r Skorfa-Solatrum; 99v Soldula-Spica; 100r Spina egyptiaca-Spongia; 100v Sporicon-Stacter; 101r Stafilina-Stilbon; 101v Stilbus-Storax; 102r Storax liquida-Strignus; 102v Strobilia-Suchar; 103r Sucanum-Susinum. 103r T littera-Thahaleb; 103v Tabaisir-Tantiades; 104r Thaom-Tauri; 104v Tauros-Theoritis; 105r Tepetrissi-Tetraceus; 105v Tetrafarmacum-Timelea; 106r Timiama-Tiumallus; 106v Tisis-Tlapsim; 107r Toartrium-Tragion; 107v Tragion-Trifolium; 108r Trifolion-Trociscus ygia; 108v Trociscus amazon-Thus; 109r Tusuch-Tutie. 109r U littera-vernix; 109v Vertanum-Vinum madragoratum; 110r Viola-Vitis nigra; 110v Vitrago-Ungula; 111r Vinfasidos-Vuvon; 111v Uzifar. 111v Y littera-Ytralipta; 112r Ybida-Ygienon; 112v Ygilafi-Ypofragma; 113r Ypogeon-Yris; 113v Yrisceptron-Ytria. 113v Z littera-Zamorad; 114r Zanda-Zara; 114v Zirbus-Zurumbet. The classification given below is based on a collation of the following entries: Baidh, Balliotem, Batarum, Bupleuron, Cameleon (1), Cunilla, Filire, Sauich. Of particular importance are the lacunae in entries Baidh and Sauich, and the fenestrae in Cameleon (1). For print H, the following chapters were collated: Acedula, Agma, Alcula, Alintisar, Alumen alasfur, Amoniacum (1), Amoniacum (2). This manuscript presents a text that is very close to both B and e.
This manuscript presents a text that is similar to B.
Paris, BN lat. 6958, 11r-275v. Padova, Biblioteca Civica, C.M. 101, 1ra-117vb. This manuscript presents a text that is similar to B. Many thanks to Iolanda Ventura for pointing it out and collating it. This manuscript contains a text that is similar to B.
Zagreb, Metropolitanska knjižnica MR41, 3r-141v. Chambery, Bibliothèque municipale 16, 17r-235r. 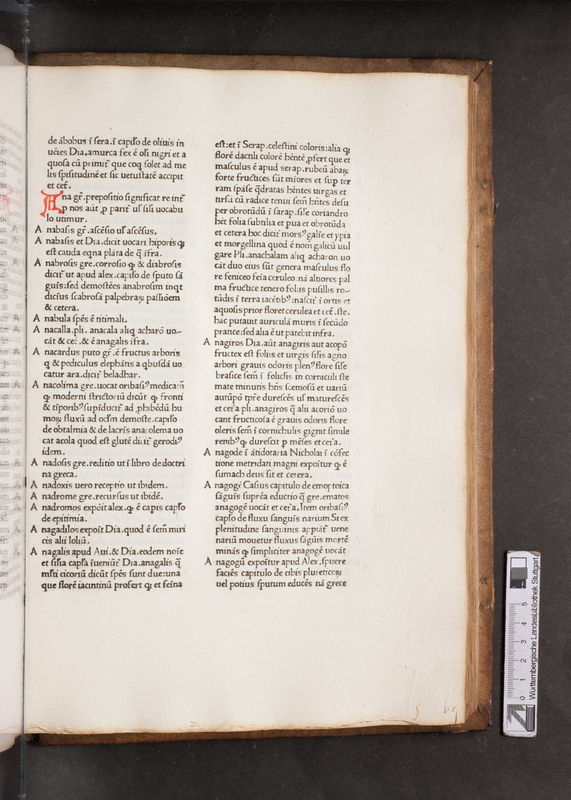 Parts of this manuscript have been digitized [] by the IRHT. This manuscript is part of the B group. Clavis sanationis Simonis Ianuensis, Venetiis per Simonem de Luere 1507. Accessed at Gonville and Caius College, Cambridge. Overall, G presents a text that is near identical to R, and very similar to C.
Sinonima Simonis Januensis, Padua (per Petrum Maufer) 1474. Accessed at the Royal College of Physicians, London. This book presents a text that is very close to C.
Venice, Biblioteca Marciana VII 12, 1r-125r. Bologna, Biblioteca Universitaria lat. 913, 1r-236v. This manuscript also contains a text that is close to B.
Basel, UB, D I 8, f. 1r-75v. Many thanks to Iolanda Ventura for finding this manuscript. Torino, BN, 1447 (K II 8). Many thanks to Iolanda Ventura for finding it. 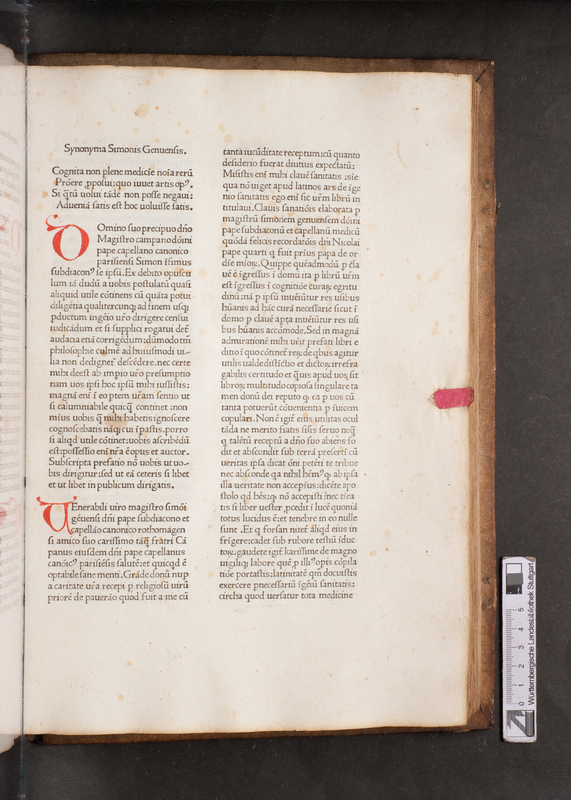 This manuscript contains a version that is close to B.
Vatican, Reg. lat. 1910. 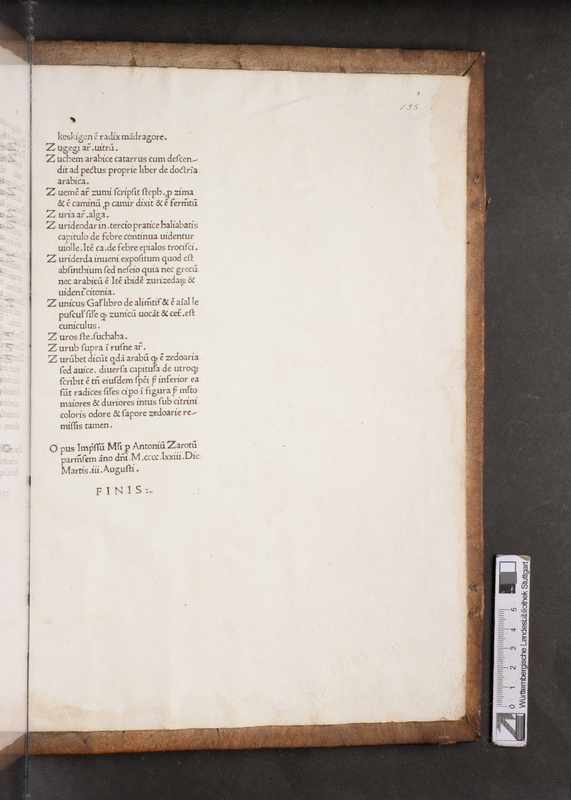 Many thanks to Iolanda Ventura for finding it. The manuscript is part of the B branch of the transmission. This list contains some selected manuscripts transmitting the abbreviated version of the text. Overall, one notes that the text differs widely from the original. Moreover, there appear to be quite a lot of variants within the transmission of the Epitome itself. In the Baidh entry, this manuscript reads Baich, which is clearly just a misreading and distinctly different from Barob. It is therefore most likely part of the B branch. The Sauich entry is much shorter than in the original version and the other manuscripts of the Epitome listed below. It consists of just of a few words. This manuscript follows the text of the B branch in entry Baidh. This manuscript contains the abbreviated version of the text. A quick survey of the text reveals that this version differs significantly from the original, see also z below. A number of lemmata are missing, whereas others have been added. The Greek and Arabic words are missing, and the respective entries where one would expect to find foreign language alphabets have been removed or changed. In the Baidh entry, the text follows the B branch of the stemma. The crucial part of Sauich, which was still in existence in z, is missing. But overall, it is safe to say everything points towards the fact that the epitome is based on the B branch of the stemma. It would not be practicable to include the epitome in the apparatus of the original version, as too much material has been altered. This manuscript contains a heavily abbreviated version of the clavis, which is also transmitted in numerous other witnesses. A collation of the entry Sauich reveals that z is part of the B e family. The lemmata on this page are a rush transcript, and should be used for general information only. This page was last modified on 25 July 2016, at 13:52.